OptinSkin Is Dead! Try These 7 Alternatives To Build Your List! OptinSkin is used to be the best list WordPress plugin. When it came to the scenario, there were a very few plugins that could provide the features of OptinSkin. It was one of a kind. With pre-designed templates, easy customization, and multiple placing options, it became the best solution for list building. But the sad news is, OptinSkin is no more in business. Even the official site of OptinSkin is acquired by someone else. In this post, I have compiled the list of best OptinSkin Alternatives to build your email list effectively. Thrive Leads is the most affordable list building WordPress plugin. By using Thrive Leads, you will feel like you have your own list-building and conversion expert. It will somehow combine every type of opt-in form that you will need in one single plugin. Thrive Lead also comes with a drag and drop editor to create an elegant design. It also comes with a highly advanced but very easy to use A/B testing feature. It will effectively increase your conversions rates. No doubt, it has an all-in-one list building solution. OptinMonster is a cloud-based lead generation software launched in 2013. It has a streamlined and stunning interface. Using this tool will make it easy for you to build excellent lead capturing forms, without hiring a developer. OptinMonster is an all-in-one list building software that supports all the opt-in form types. 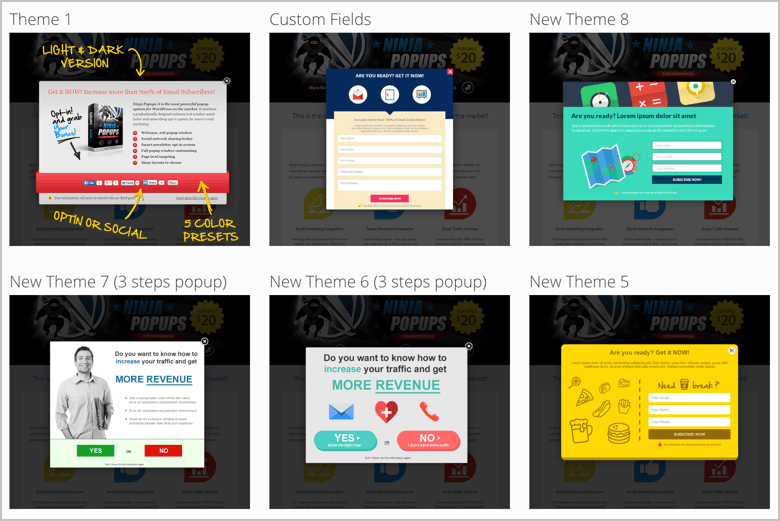 Each opt-in form has its own set of templates you can use to create a different looking form. It comes with basic point-and-click from the editor, and you can select various elements on the form to edit its supported properties. It also provides a unique Canvas theme, a blank theme, and you can use HTML and CSS editor to build it as an opt-in theme. It has more than 65 ready-made templates to get started immediately, and it offers a drag and drop builder that will let you create highly converting opt-in forms. The best thing is you can simply enhance the popups by 26 animations along with sound effects. It will also allow you to create different campaigns right from the basic lightbox popup and sidebar forms. Bloom is another great opt-in plugin by Elegant Themes. It mainly works by adding email opt-in forms right to your website, and each of them can be easily connected to your email marketing software. When someone signs up using the Bloom opt-in form, they will automatically get added to your email list. It works with many different email marketing software, and it will allow you to create discrete types of opt-in forms that will appear on the different areas and a section of your website, along with different forms. It will convert visitors into loyal customers. It has 115 pre-made designs that you can choose from to create actual popups for your site, or you can create it from scratch. You can also customize the existing designs according to your wish. For all the forms, you can simply choose orientation and borders, along with the text and background color. It will also provide trigger options that will help you display the right types of opt-in forms. 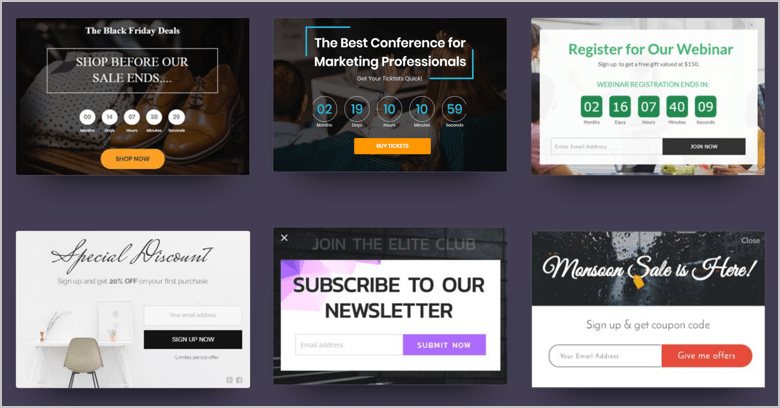 ConvertPro is an all-in-one lead generating plugin that will let you create many different lead capture forms, along with popups. It is fully flexible and will provide a plethora of customization options. The installation process for this plugin is very easy. The drag and drop form builder will create and customize your forms to be simple and streamlined. It is fairly priced, and it has a “Test Drive Before You Buy” option that will provide you free access to try the full product right on the mock WordPress site. It comes with a library of conversion-oriented designed templates. Just install and use the one you need. You will get a library of best-performing templates that can be simply used to get started immediately. Basically, all of the templates are fully mobile- customized that truly indicates your popup will look stunning in the mobile screen too. Ninja Popups is one of the best selling WordPress plugins in CodeCanyon. It features a drag and drop visual editor that will help you in creating many opt-in forms and popups. It integrates with all the major mailing systems, which include MailChimp, GetResponse along with JetPack, ConvertKit, and InfusinonSoft. It will provide you full compatibility of the pop-up plugin, along with the mailing systems. 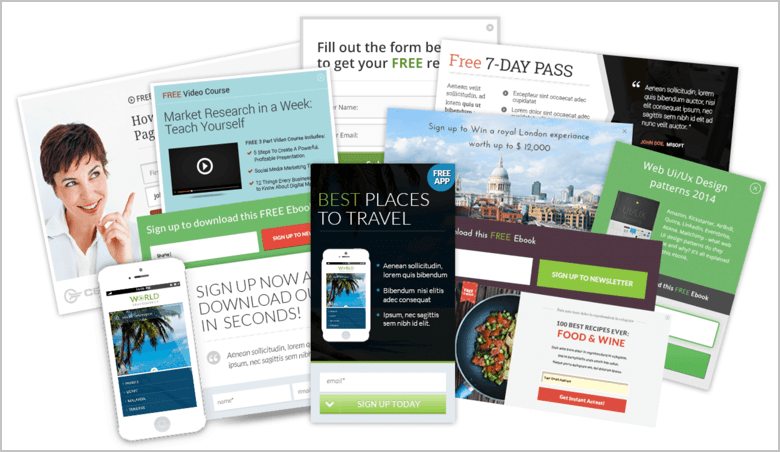 This popup plugin tool will bring many high-quality leads along with increasing opt-ins right on your mailing list. It also provides 74 awesome animation effects, along with an inbuilt A/B testing feature. This plugin comes with Google Analytics Integration, so you can easily track the clicks and conversions, along with many other metrics for the option and popups. List Builder will convert one-time visitors into lifelong readers and potential customers. It will help you create professional looking pop-ups that will appear on the clicks, timers, and when people are trying to leave your site. It comes with advanced drag and drop functionality. This one is the most advanced email marketing and capture tools on the Internet nowadays. You can easily customize it to fit your brand as it will give you control over the background color and text color, along with text fonts and more. The drag and drop interface comes with many options that will let you create many different types of popups and opt-in forms. If you don't have time to create a popup from scratch, then you can simply use pre-designed templates. This plugin is mobile optimized to ensure your popup will look great on all screen sizes and resolutions. It is also integrated with A/B testing that comes in handy to optimize all your best performing campaigns. No doubt having an email subscriber list is the key to running a successful blog, and WP Subscribe Pro will help you grow your email list. 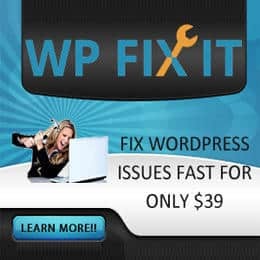 WP Subscribe Pro mainly supports MailChimp, Aweber, and FeedBurner, and this is one of the must-have plugins for any blog. It comes with an inbuilt exit-intent feature that will simply allow you to capture the abandoning visitors. You don't have to apply coding; simply install, activate, and ready to go. It also comes with 30 days money back policy. 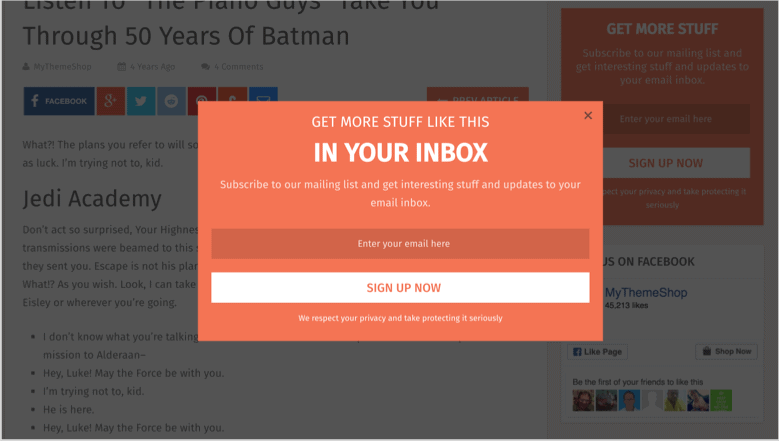 It will show a pop up when a user is trying to leave your site, giving them another chance to subscribe. WP Subscribe Pro is fully responsive, and it will work smoothly with MyThemeShop themes. So these are some of the best OptinSkin alternatives. If you can't decide which one to choose, here's my suggestion. I use and recommend Thrive Leads. 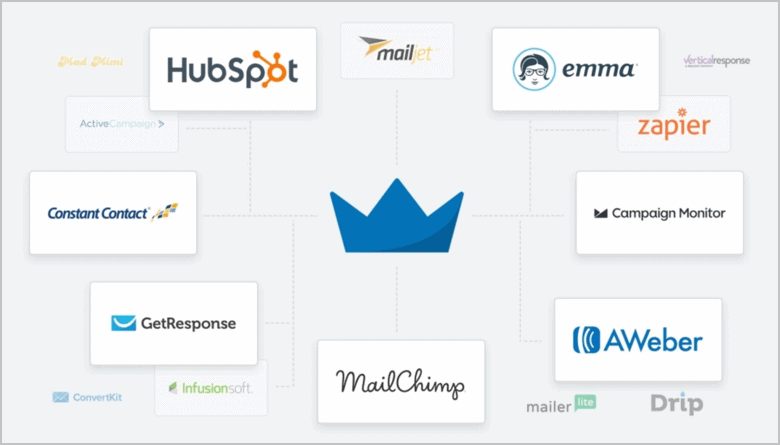 This is the only plugin you need to grow your email list. Thrive Leads is the best alternative to OptinSkin. It has everything you need to build your list. And the great thing is, it's affordable. My two recommendations on the list are OptinMonster and Thrive Leads. OptinMonster is a subscription based platform but I like the fact that you can manage your forms for multiple blogs on one dashboard. How about that? So true. But the best thing about Thrive Leads is, it’s cheap and it offers all the features of OptinMonster. PS: Thrive Leads is the ultimate list building plugin for WordPress.